"The graduate programs at the University of Portland is where I understood how wonderful learning could be for all children. I was given the tools to change the educational system for the better, while helping all children learn in their own best way. I’m not your average teacher, and I hope I never am. I believe that all children can learn. That’s why I continually adjust my practice to better help all children learn, grow, and be the best they can be." Neuroeducation is the study of how people learn best, acquire new information, and use knowledge to advance their own thinking. Drawing from the fields of neuroscience, cognitive psychology, and language, this new academic discipline uses brain-based scientific findings to develop a novel approach to working with students who have struggled in traditional school settings. This online course is designed to help educators make a paradigm shift in their practice by shifting their focus from teacher-directed pedagogy to a framework that considers learning from the perspective of the learner. We are excited to offer an online “Gateway to Neuroeducation Studies” course for individuals who are interested in the field of neuroeducation, but not admitted to or enrolled in a University of Portland graduate program! The course is constructed to provide an introduction to the study of neuroeducation by allowing participants to work as a cohort and share ideas with each other in group forums each week. Students follow the University of Portland semester schedule but are able to complete each week's module on their own time and at their own pace. Course content is presented in an engaging video lecture format with embedded review questions that help summarize the main points of the lesson. A knowledgeable instructor helps guide the thinking and learning of each enrolled student by providing in-depth feedback on assignments and activities. This course covers a wide variety of topics and is designed to inspire all educators to re-think their teaching practices to maximize the brain's ability to acquire new information. Participants will find novel ways to connect the content being learned to individuals in their own professional settings, including those who work with a diverse range of populations such as English Language Learners, individuals with special needs, those who are deaf/hard of hearing, and individuals with neurogenic and neurodevelopmental disabilities such as those with Autism Spectrum Disorders. Course Description: Neuroeducation is a translational field of study that utilizes literature from various disciplines. 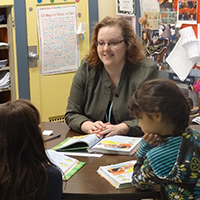 At the University of Portland, this unique program utilizes research from cognitive psychology, neuroscience, and language to inform educational practice. This course is designed to be taken online as a gateway to other neuroeducation studies. Graduate non-matriculated students only. Course Rationale/Justification: Neuroscience is quickly providing many studies that have direct and indirect application to educational practices. If learning is a neurobiological set of processes, then translating neuroscience to education is necessary to understand the needs of all learners. This course builds on the student’s understanding of education and cognitive psychology by adding some translational interpretations of neuroscience intersected with language for an overview of the program in neuroeducation. Course Restrictions: This course is restricted to individuals who (1) hold a bachelor’s degree, (2) are not enrolled in a University of Portland graduate program, and (3) are not residents of California or Massachusetts at the time of enrollment in the course. Course Registration Process: For details about how to register for this course, please contact Anne Rasmussen, Graduate Program Specialist, at rasmusse@up.edu or 503.943.8257. Or, click on the “Request Info” button below.